Big disclaimer upfront: my knowledge of Access is minuscule. I bumble around and am fully aware that there are probably a million things that I could do with it, but can’t be bothered learning. They speak of “just-in-time” learning- well, as far as Access is concerned, I have “just enough” knowledge for it to do what I need. The British Empire, bless its cotton socks, was very good at one thing (at least) and that is information control. Let’s imagine a letter written in Port Phillip about some little brouhaha that Willis might be involved in. It would go to Superintendant La Trobe as inward correspondence; he would make some comments on it in a covering letter and send it to Gipps in Sydney as outward correspondence; it would arrive there as Gipps’ inward correspondence and then he would make further comments in another covering letter and send it all to the Colonial Office as a Governor’s outward despatch. It would arrive in London some 5-8 months later, be minuted by various public servants as it moved from desk to desk in the Colonial Office, making its way to the Secretary of State for the Colonies, then the reply would move back in the following direction. All of this would be numbered, and entered in inward- and outward- correspondence letter books. Beautiful though this system might be, it does mean that a single letter might appear multiple times in LaTrobe’s, Gipps’ or the Secretary of State’s archives, and may appear yet again in collections of correspondence bundled up for a special report. Likewise for my Canadian material, I’m working from a single archive divided up into separate files in my computer, and thus of no use to anyone else but me in finding where it is in my own records. But each document also has its own numbering used in other archives and microfilms- and this is the information that is important for footnotes. What I needed was a way of identifying an item and noting all the different numberings it might have in the major archives that I am working in. 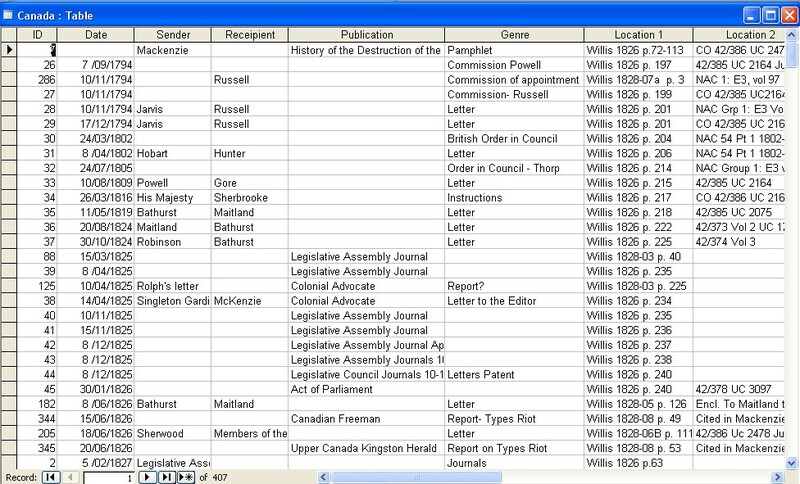 So I have developed a very basic database that shows the date of the correspondence, the names of sender and recipients, enough identifying information for me to know what it’s about, where it is in my own computer files and then the number it has in the major collections used by researchers generally that I would record in a footnote. I stop at three locations- there are no doubt more, but this is probably enough. The majority of entries relate to correspondence, but I also put newspaper articles in as well. When I view it as a table, it runs chronologically. I feel a little sheepish admitting to such a paltry database. It is an idiosyncratic little thing, of minimal use to anyone else, but invaluable for me- and that’s probably the most important thing. No doubt others would say “But why don’t you use ——- instead?” and they’d probably be right. I think, though, at some stage you need to stop shopping around for the perfect program, and just sit down and start putting some data into it and using the damned thing. When I reach its limitations and become frustrated, then I’ll either learn the extra functions I need within the program, or look for something else. In the meantime, this works okay for me and I’m just getting on with it. The Sitters is only a small book- 131 pages- and as with other Alex Miller books, its simplicity is deceptive. Its narrator is an elderly, somewhat self-deprecating and yet emotionally frozen painter who has not been able to return to his painting after achieving success with an earlier portrait The Tan Family. I felt as if I had met this character before in other of Miller’s works – the voice is similar to that in Lovesong and Miller has written about painting before in Prochownic’s Dream. Presence is brought up against absence as well. The painter meets, fleetingly an expatriate academic, Jessica Keal, who has returned to Canberra on a fellowship, and he is instantly attracted to her. After a commission to paint a series of sketches of women, including her, he asks if he can paint her portrait- not just one, but many studies of her, over an extended period of time. Yet when he does paint his first portrait of her, he finds that he leaves her out of the painting: the room, the bed, the furnishings are there, but she is absent. He does not need his subject to be present, and when she is, he doesn’t necessarily paint her. He had earlier in his career painted a close, recently deceased friend as a corpse, just died, and years later he will paint Jessica again, rubbing her chest in heart-pain. Some years earlier he had painted the back view of his agent. His agent perceived this painting as a joke, which on one level it was, but it also revealed something about our narrator as painter.In a portrait-sitting, he is painting from life, but the life is not necessarily present in that moment. He has never painted his family: indeed, he lives in a vacuum with his memories of his family intentionally suppressed, and his relationship with his son detached and observational. He lets us know early in the book that he has distorted and embellished his memories of his father as some type of artistic mentor and influence. He has extended his memory of a single pre-WWII day painting outdoors with his father into a golden-tinged lifetime of paternal artistic inspiration, and this benign memory has been overshadowed by the words and actions of the bitter, damaged man who returned from World War II. His sister, from whom he had become estranged through inattention rather than intention, had written to him that she’d come to see one of his art shows but left without speaking to him, not wishing to intrude. She had since died, and it was in painting The Tan Family, the painting that brought him the greatest praise, that he painted his grief for her, even though he didn’t recognize that. The book is titled The Sitters (plural) and although ostensibly it is a slight story about an elderly painter and a younger female sitter, the ghosts of his childhood are sitting, too. There are multiple sitters, not just one, and he is painting them present from their absence. The book makes much of silence, but there’s much in it about language. The sentences are short and pared-back, and although his narrator professes to eschew words, there is a joy in them as well. The description of his sister as “ungainly, angular, gangly, ugly” betrays a joy in the sound and shape of words. It is a reflection on the act of representation and capturing the essence, whether it be through words or through art. This is a carefully crafted little book with nothing superfluous. There are no chapters and the reader has to work a bit in following its leaps back and forward. It sustains a sexual tension well, but is tinged with regret and vulnerability as well. It was shortlisted for the Miles Franklin in 1996 (a year with a majority of female authors, by the way); pipped by Christopher Koch’s 450 page Highways to a War. You’d be hard-pressed to find two more dissimilar books. Read because: David recommended it. There are eras in Australian history which, in my imagination are flooded with light- the gold rushes is one; the time around Federation is another- when Australia seemed open to opportunities, hungry for change and with the future opening up before it. Then there are other low, muted, hold-your-breath times, and I think that immediately after World I would have been such a time. So much death and absence, felt so keenly at the intimate and everyday level and yet played out so far away: men returning broken, damaged and strangers to themselves, and the incomplete, unresolved grief about those men who failed to return. Then, overlaying all this is another winnowing as the Spanish flu sweeps the country, as if Death has been brought home from across the sea. Bereft is set in this time. Quinn Walker returns from the front to his childhood town, Flint, in western New South Wales. There is no homecoming celebration: instead he skulks in the bush, too frightened to appear in public. Ten years earlier he had fled when his sister was found raped and stabbed, and he was accused of the crime that his father and uncle swore to avenge. Watching his house from a distance, he realizes that his mother is very ill, probably with influenza, and that his father, frightened of catching it too, spends little time at the home, sitting on the verandah outside his dying wife’s window. And so he is emboldened to approach the house when his father is not there, and his mother, not sure whether he is a hallucination or not, speaks with him. She has lost everyone- her husband to bitterness and the quest for revenge, her daughter to the slaying, her eldest son to Queensland. Quinn had just disappeared, confirming the rumours of his guilt and then was reported dead from the front- but now her younger son returns. There is the word ‘orphan’ for a child who has lost its parents, she says, but no word for a parent who has lost her children. Or, thinks Quinn, for a brother who has lost his sister. They are all just bereft. He is being watched while he hides out in the bush. Sadie Fox, a dishevelled, fey little orphan knows many dark things, and Quinn does not know quite what to make of her- changeling? spirit? urchin? hallucination? In the face of so much bloodshed and pain, the line between life and death seems tenuous. It is a time when clairvoyants feed on unresolved grief, and when many people are open to spiritualism. Quinn’s own experience of the mud and the gas of the Front leaches into his present, and his own long absence from his home town means that his own identity is a vacuum. 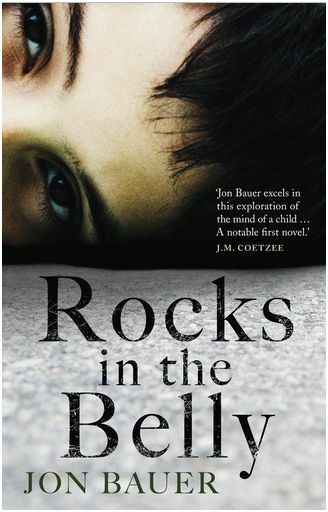 Although Womersley has worked very hard in embedding the narrative within a particular time, I can see why this book has been described as ‘rural gothic’, along with other Australian novels that span right up to the 1970s and 80s- think Craig Silvey’s Jasper Jones, Elizabeth Jolley’s The Well and Sonya Hartnett’s Surrender. I do wonder, though, if the easy interchangeability of this book with others set some 70 years later suggests that (a) country life and country people do not change at all, and/or (b) that he hasn’t quite captured early twentieth century relationships and interactions very clearly. Did people speak, move and interact in a qualitatively different way in 1919 compared with 1969? I’m not sure. I can see continuities, too, with his first book The Low Road, in that they are both stories of escape and hiding. In both of them there is a sense of pursuit. 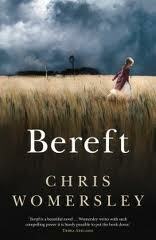 Bereft is one of the three books that have made the cut as the short-list for the Miles Franklin prize. All up, Bereft is a book that weaves many strands- historical fiction, a type of crime fiction, the supernatural, and small-town claustrophobia- and it does it well. So far for me, though, That Deadman Dance is the front-runner- although my record in picking the Miles Franklin winner is, so far, abysmal! I was right but disgruntled in 2009 and wrong and outraged in 2010. Two young men, both working in the law, in two British settler colonies in different hemispheres, both diarists. Mary Larratt Smith Young Mr Smith in Upper Canada, Toronto, University of Toronto Press, 1980, 184 p. & notes. J.M. 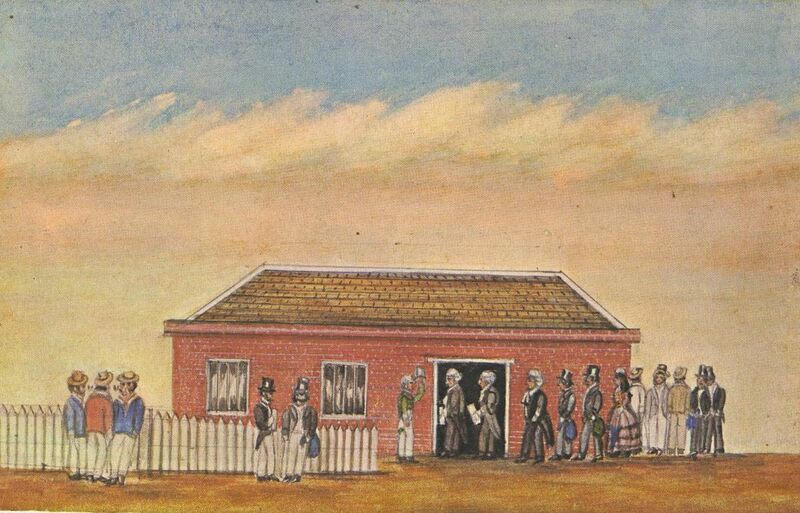 Bennett (ed) Callaghan’s Diary: The 1840s Sydney Diary of Thomas Callaghan B. 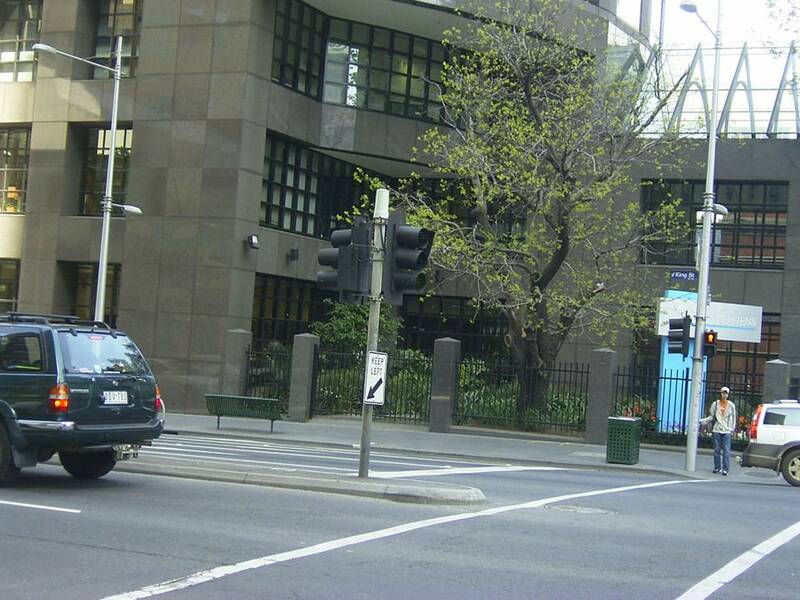 A. of the King’s Inns, Dublin, Barrister-at-Law, Sydney, Francis Forbes Society for Australian Legal History,2005. Available here. Young Mr Smith in Upper Canada- what a terrific title! It has echoes of “Mr Smith goes to Washington” and I was hoping that it might be an impassioned expose of Upper Canadian life, albeit a decade or two after the time I’m interested in, but no such luck. Instead “Young Mr Smith” was Larratt William Violett Smith, who went to Upper Canada in 1833 with his family as a twelve year old boy and pretty much stayed there. His diaries, transcribed and annotated here by his grand-daughter, cover the years 1839 (when he was aged eighteen) up to 1858 and aged thirty eight. The author and granddaughter, Mary Larratt Smith, who shares half his name- has (or rather had- surely she’s not still alive?) one clear memory of her grandfather when she was taken to see him in the summer of 1905 when her grandfather was 85 and she was not quite three. He lived in a large, early Victorian house called Summer Hill in what is now the Summerhill area of Toronto, with its own eponymous subway station. It took her about ten years to transcribe his journals and a small collection of letters which now rest in the Canadian History Department of the Metropolitan Toronto Library. The author/editor has embedded the journal entries and letters into her own explanatory narrative, and her occasional references to ‘my grandfather’ remind you that she has an emotional stake in this work. I did find it annoying that the journal entries were not typographically marked out from her own surrounding material. There was an italicized date at the start of the extract, but then she would sometimes slip between Larratt Smith’s words and her own with no clear visual marker of the difference. The letters, at least, were presented in a smaller font, and much more clearly distinguished. In 1833, “Young Mr Smith’s” father, Captain Larratt Hillary Smith from Devonshire, took advantage of the land grants offered to veteran law officers, and took up a large tract of land at Oro in Simcoe County. He undertook the 38 day journey with his wife and four children, arriving in York where they stayed long enough to enroll Larratt and his younger brother George as boarders at Upper Canada College, before shifting the rest of the family to take up their primitive farm some distance away. The farm land was stony and unproductive, the family was unhappy, and after four years the family moved closer to Twickenham Farm, closer to Toronto, leaving the Oro property behind. Larratt and his brother continued at Upper Canada college. After serving as a 17-year old Lieutenant in the Home District militia during the 1837 Rebellion, Larratt then went to England. His Uncle George, with no sons of his own, had proposed training his nephew in the wine business with a view to eventually making him his heir. But Larratt didn’t like it, returned to Canada, and his brother George went in his stead- probably not a good move as brother George ended up a very wealthy man. Larratt decided to go into the law instead, and so he was articled to William Henry Draper, the solicitor general, and lived in Toronto as a young man-around-town. And here we find him, attending the various balls in Toronto, hooning around climbing greasy poles and chasing pigs at the ‘Olympic Games” celebrated in Toronto in June 1843, stealing cats, shooting, singing, acting. There are many similarities with small colonial life in Australia- assemblies, debating club, church etc. He lived in what sounded like a 19th-century share house with other young lads his own age, and had to shift lodgings several times. Although he lived and worked as an independent young man in Toronto, his connections with his family at Twickenham Farm were strong. His father would often come into town and Larratt would often visit them and stay several days with them on holidays. The journal entries are fairly short (although no doubt they would have appeared longer written in long hand) with rather a preoccupation with the weather- although from what I read of Upper Canadian winters, who wouldn’t be obsessed with it. [I’m slightly- very slightly- regretful (for about two seconds) that we won’t be visiting there during the depths of winter as I just can’t imagine what such cold weather would be like.] He is interested in several girls, but eventually his attentions focus on Eliza Thom whom he marries on 23rd December 1845 on a day that was 18 degrees below zero at 7.a.m., and “a very fine day”. There are not many intensely personal entries in his diary, and when they do occur, it is at a time of great distress: the loss of their first baby at four weeks from whooping cough, and six years later the death of Eliza herself. The cause is not specified, but she died from what started as a cold a week earlier. His two children are sent to live with their maternal grandmother, his own family having returned to England some years earlier. I must have a house of my own before long. I miss my boys dreadfully. At the same time I have made up my mind (unless a pretty face makes a fool of me) that my better half that is to be ‘must bring some grist to the Mill.’ Now don’t imagine that I crave Fortune’s arrivistes, for I detest the species, & I could not marry the richest woman in the world if I could not win her affect, but I feel that the chain once broken is not the same, & that, bringing as much love as one can, there may be other qualifications not wholly to be disregarded. Larratt Smith did remarry, a girl called Mary Elizabeth Smith, 18 years his junior and they went on to have eleven children together. Larratt Smith paddled around in the shallows of political and legal life. He was certainly known to many of the figures that I’ve been reading about- the Robinsons, the Jarvises, the Baldwins and the Boultons- although in many cases they were the sons of the men who were there when Judge Willis was in Upper Canada. Although his parents had returned to England from their sojourn in Upper Canada, the family connections remained strong. His father came over for a surprise visit- Larratt Smith had not received the letter telling him of his imminent arrival- and his sister came over to join him. Larratt himself traveled home for a while, and there was much talk, at least, of visiting. BUT This was not the case for a second Mild Colonial Boy of the Law, Thomas Callaghan who arrived in Sydney in 1840. You can see a picture of him here. I lay down on the bed, when a knock came to the door and Judge Stephen stood before it. I was quite in undress, however he came in and stayed with me for some time. He is a man of quick and intelligent mind, but of a delicate and nervous frame. He is a gentleman and rather unaffected, though having a very good opinion of himself. (10/3/1844). In rather more decorous circumstances, he also came into contact with William A’Beckett and Richard Windeyer who assisted him in his career. He struggled to find his feet at first, and kept body and soul together by court reporting, which he did not enjoy. His contacts pulled on their strings of influence, but he had to wait several years until eventually being appointed a Commissioner in the Court of Claims, and then acting Crown Prosecutor. Once promoted to Crown Prosecutor, his diaries trail away. Callaghan’s journals, which apparently were penned in execrable handwriting, have been recently released with a introduction by J. M. Bennett. Bennett provides a sound introduction, but then leaves us in Callaghan’s very capable hands. September 2, 1843. My last entry of June the 20th! This is improving in regularity with a vengeance! What’s NVivo? you may ask. It’s a qualitative data analysis software program that I use to keep control of the data that I’m gathering as part of my research. 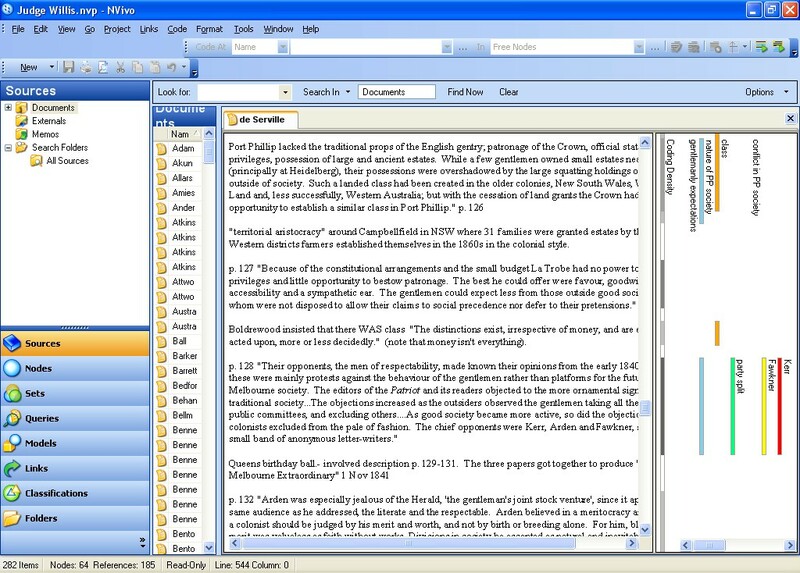 You can read more about NVivo here. I first came across NVivo in its earlier incarnation as NUD*IST, which was a much more playful and memorable name. I am still using NVivo 7 because my clapped-out old laptop here wouldn’t download NVivo 8, and now I see that there is an NVivo 9. Fortunately I use mine under my university’s site licence (I think that it’s very expensive) and for now the older versions are still available. 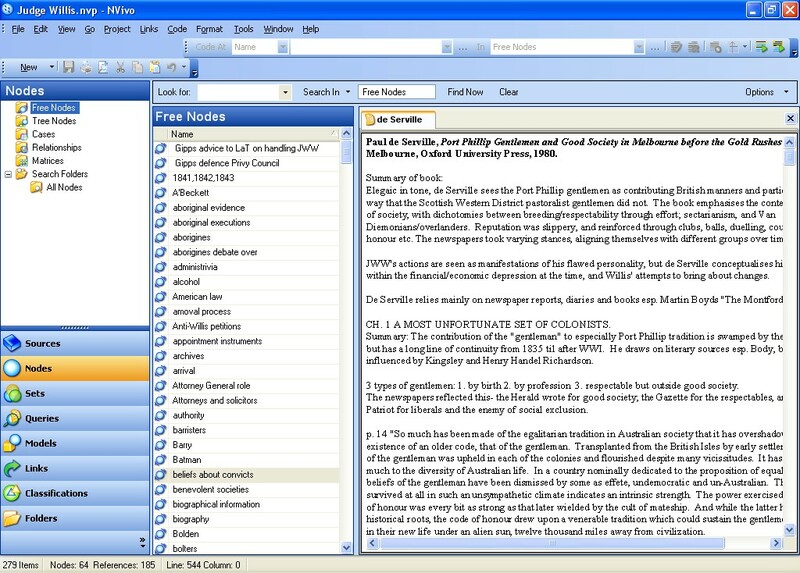 NVivo (or NUD*IST in its earlier life) was developed originally by Lyn Richards, a sociologist at La Trobe University, and it reflects many of the time-honoured ways that academics work with data anyway- identifying major themes and points (which often found their way onto index cards); highlighting themes in a particular document with different coloured pens, cutting up documents to group all the themes together etc. NVivo does much the same thing, digitally. And because every project is different, and because people work differently, no two NVivo outcomes would be the same. First you need to put a document into NVivo. This isn’t a problem for me as I type up notes on the computer as I go. Here’s a shot of all the documents or ‘sources’ that I have about Judge Willis in Melbourne. Some of them are full transcribed documents, others are my notes. If I have the document in hard copy or saved as a PDF elsewhere, I might save it as a ‘proxy document’ with a very stripped down content skeleton, with the expectation that I can go back and look at the full document easily. When you have a document you identify the themes in it. You call these themes ‘nodes’, and it’s just like tagging, or using a different coloured highlighter pen for each theme. You develop the themes as you go along. So, in the picture about, I might be reading Paul de Serville’s ‘Port Phillip Gentlemen’, and I might notice that a paragraph is about ‘authority’ or ‘class’ or ‘gentlemanly expectations’. I would highlight the paragraph and select the node on the left hand side, or create a new node if it was something that I hadn’t come across before. This means that you develop a long list of nodes that you’ve identified across all your documents. You can group related concepts into ‘tree nodes’ or just leave them alphabetical as shown below. Because you have developed the nodes yourself, you get to know what is there and move around it quite quickly. When you’re working with a particular document it also collects the nodes that you’re working on as you go along into a drop-down menu, and as they tend to recur, it means that you’re working with a smaller set. But here is my master list as of today of the Port Phillip nodes I’d developed. If I worked on a new document tomorrow and identified new nodes, they would be added to the list. 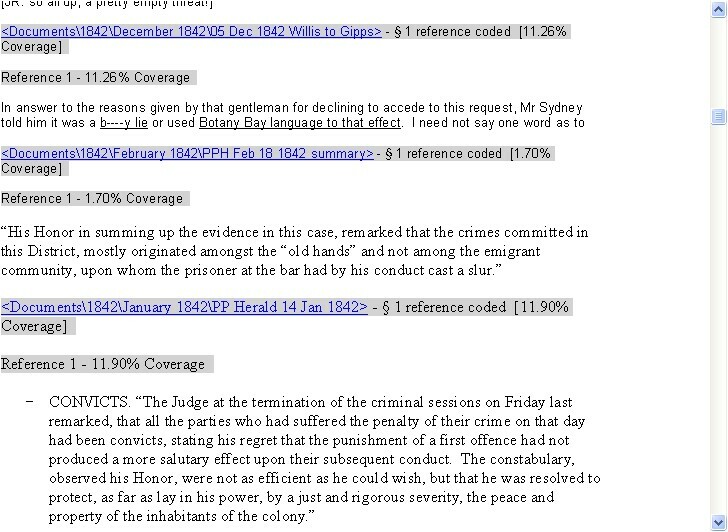 So if you want to find, for example, all the documents that you had tagged as being ‘beliefs about convicts’, then you can bring them all up onto the one page. If you click on the underlined hyperlink, it takes you to the source document where you coded it in NVivo. It’s better not to code great slabs of material; just enough for you to get the gist and then go back to the source document for the surrounding material. The real advantage of this is that it means that you don’t forget about material that you read years earlier, especially once it mounts up. It also brings together the primary and secondary material again when the tendency is to develop the tunnel vision of “now I’m working on letters”, forgetting about the insights you’d discovered in secondary sources. You can write ‘memos’, which are your own reflections on a particular point, which can also be coded and thrown into the pot as well. 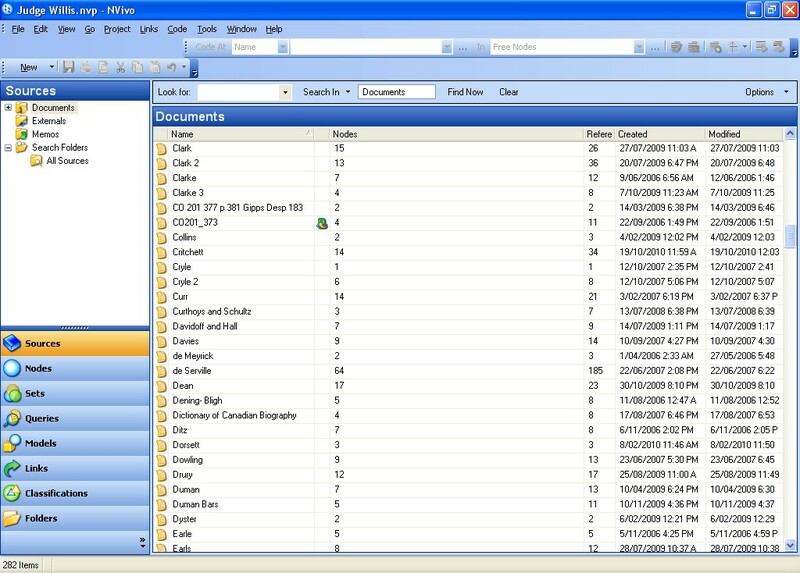 You can also go back to a particular document (or ‘source’) and at a glance see the themes that you’d identified in it. For example, here’s my screen for Paul de Serville’s ‘Port Phillip Gentlemen’. At p.128 I’d found information about ‘the nature of Port Phillip society’, ‘party split’ ‘Kerr’ and ‘Fawkner’ and coded that paragraph accordingly. It is intended that you develop the nodes as you go along which means that at some stage they become big, baggy unwieldy monsters. At this stage you need to think- do I need to split this concept into smaller nodes? Or alternatively, you find that you’ve made several nodes that are really talking about the same thing- are they really separate concepts? would I lose some particular quality of the concept if I combined two similar nodes? It does also mean that sometimes documents you read earlier in your research have concepts that were not apparent to you at the time, but that’s true of research generally. 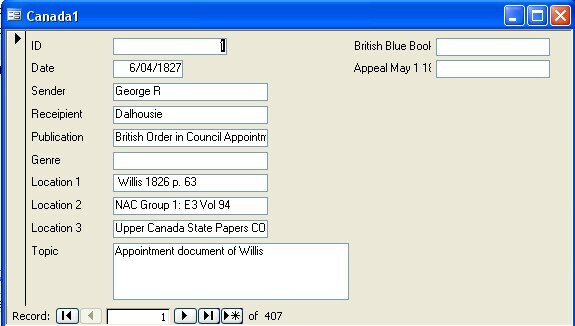 At least with a digitized program like this, you’re likely to come across the documents again under a different code and can go back and add extra codes as you go. It’s intended that it keeps growing and changing. For me, it’s certainly more dynamic than having notes filed in hard copy in folders where you forget you’d ever even seen the document at all. It also means that my own fleeting reflections in ‘memos’ are brought back to life again. As I said, I’m using an old version and I note that NVivo 9 has fixed up one of the real bug-bears – being able to see the codes while you’re actually coding- which for some reason you could no longer do, even though very early versions of the program did have this feature. It would be worth getting NVivo 9 for this feature alone- in fact, it may even prompt me into splashing out for a new computer. It also claims that you can use PDFs but I’m not sure- earlier versions claimed this too but it only worked for OCR’d or text-based PDFs – not image based PDFs which it inevitably seemed mine were. I usually just save the PDF on the computer and make a proxy document (i.e. a dot point summary)- it’s too time consuming mucking around with it. The drawbacks? The major one is the fear that the whole system is going to crash and that you’ll lose everything. Also, there is the limitation that you can only get out of it what you put into it- it takes discipline and routine. I type up my notes, save them, print it off (yes, I do keep hard copy- 2 sheets to a page), put it into Endnote, put it into NVivo, code it, tick on the top of the hard copy that it has been endnoted and N-Vivo’d and then file it in a ring folder alphabetically by author. The folders on my bookshelves are multiplying alarmingly. It also has to be an ongoing process- I have to be prepared to go back and fix up the deficiencies in the coding when I happen upon a document that I’d read early on, and sometimes this is a bit distracting. But this is the price of keeping it current. I do have parallel systems: I also tag in Endnote and, to a lesser extent Zotero, which I use for internet-based material and somewhat less methodically. And the advantages? Particularly with my family history of Alzheimer’s, I’m frightened of losing track of all this! I think that any researcher has this fear, Alzheimers or not. I’m relatively confident that I can put my hands on the main documents fairly easily. When I’m working at a conceptual level, it’s easy to grab together all the examples of a phenomenon e.g. ‘loyalty’, and tease it out further because it’s all in one place. Because primary and secondary sources are intermingled, then I can find concrete examples relatively easily. I’m very well aware that I only use it in a rudimentary fashion and that I could probably do other things with it, but I haven’t got time to learn them, and it works just fine for me. Of course, it doesn’t always work, as this sad experience shows. I still haven’t found the damned document that I was looking for, and I still don’t know whether it ever existed or whether I read into the document something that really wasn’t there. In the end, I wrote around it and found other evidence that was good enough- but I still live in hope that one day I’ll stumble across it again. I’m not going to give this book a star rating (something I’ve only started doing recently anyway). I really don’t know what I’d give it. I very nearly didn’t finish reading it, and that is unusual for me: I usually hang on to the bitter end once I’ve started a book. 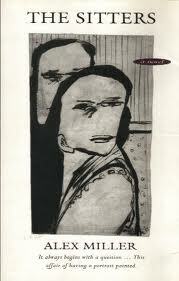 But I found this book very disturbing and unrelievedly painful and I did not enjoy the experience of reading it at all. Is that powerful writing? Probably. Did I want it to go on for even one page longer? Definitely not. The story is written in two strands. One is in the voice of eight-year old boy, an only child, whose family fosters other children as well. They have been recently joined by Robert, an older boy. The second voice is that of the same boy, now twenty-eight, returned from Canada because his mother is dying of brain cancer. Significantly, we don’t ever learn what the narrator’s name is, and although the voice of the child and the man are distinctive, the pain, injury and jealousy throbs through both narrative strands equally. A damaged and damaging child: a damaged and damaging man. In the acknowledgments at the back of the book Bauer mentions that the book had an earlier incarnation as a short story. Maybe a book so lacerating should remain in a small format- a 190 page novella perhaps. I did not want to keep reading, and I just wanted the pain, all round, to stop. I tired of the scatological references to wee, the poo and doodles by the young boy and I shuffled uncomfortably at the violence and warped thinking of the man. I didn’t want to be with any of these people. I see that it has been long-listed for the Miles Franklin. I’m not sure. In fact, I was quite positive that it was set in England- to me it had all the hallmarks of the archetypal ‘gritty BBC mini-series’- and I was surprised flipping through the book later to find that there is no real indication of where it is set. Its oppressiveness, the hedged garden, the upstairs bedrooms, all signalled England to me. I don’t think that the Miles Franklin is the right award for this book. I am sure, as Lisa at ANZLitlovers point out, that this book would spark a lively discussion in book groups. However, thinking of my bookgroup ladies, I suspect that if I, not usually so disturbed by a book, found it difficult to continue then they even more would baulk at such unmitigated pain. You’re hard pressed to find any hint of that first, small Supreme Court building now. And then he launched into his opening address which you can read through Trove (Sydney Herald, 26th April 1841). Knowing as we do that Judge Willis was to dismissed just over two years later on pretty much the grounds he identifies here, the speech is steeped in irony for us as readers. No doubt people at the time heard it differently. The Port Phillip Bar.- Upon the induction of the bar on Monday last, the supply of wig and gown was most promising-white neck- cloths were at a premium-and there was that cheerful diversity of nose and whisker surrounding the table, for which the English bar is so eminently celebrated. Touching the Demosthenian or Ciceronian orations delivered on the occasion, we say nothing, but pause until time shall have mellowed down those fiery exhibitions usually accompanying maiden efforts. Pounce, apparently, was a powder used to prevent ink from spreading and blot up excess ink.